It eventually appears when you try to launch the tool, preventing you from using it. The advice the dialog offers (restarting your computer and then trying again) is totally unacceptable, in my mind. Because of this problem, I could not rely on the tool – so I instead started using Jing more often. Eventually, I tried to see if I could do something to fix this problem whenever it occurred. 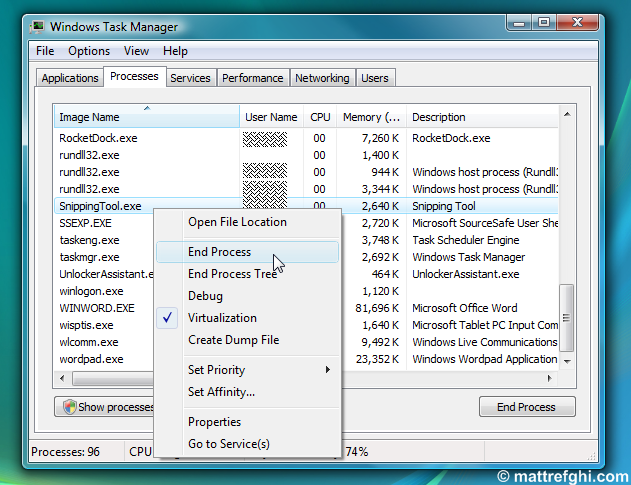 Killing the process via Task Manager allows you to avoid rebooting. Once the process has been killed, you can try re-launching Snipping Tool – it should now start up correctly. If that doesn’t fix it, and rebooting also doesn’t, you might need to run Office Diagnostics – other users have had success with that. Great article it worked the frist time i tried it! i have windows vista and i dont have snipping tool how can i get it? Some versions of the Vista don’t have it… apparently Vista Basic is one of these. To get it, you’d need to upgrade Vista to another version -but that’s not really worth it, so go for Jing (free) or SnagIt (pay) instead. Snipping Tool is part of a Windows feature called “Tablet PC Optional Components”. Provided your operating system has the feature, maybe all you need to do is enable it. To learn how to do this, see this page. Then it occurred to me that OneNote has a drawing feature. I suspected this was related to Tablet PC Inking Components, since my search showed people also had problems with Windows Journal. I also had problems with Windows Journal, indicating the Inking Components problem. In OneNote I went to the drawing ribbon and attempted to draw when a popup declared I didn’t have Tablet PC features installed (even though I checked that); and offered to install it (Yes!). Oddly, it asked for the DVD for FrontPage 2003, which I also have installed. Who would have guessed, but that was my solution. I hope this helps someone. Or you can just copy and paste the following, (from the “W” of Windows, to the last “0” at the bottom), into a blank Notepad file and “save as” as anything,reg. Then double click it to merge with the registry, restart, and the Snipping Tool will be restored. It worked for me. Thanks for this. To everyone reading: I haven’t tested this code, so I can’t speak to its specific function, aside from what Mark is saying. This is what the code will look like in Notepad. I lost the snipping tool after uninstalling Office 365. Eventually picked this up off another forum, tried it, and it worked! After having tried several other solutions this worked great! Thank you! Doesn’t work for me. I checked the existing key in my registry and it matches exactly what’s given in the text comment posted here. On attempting to run my .reg file I was told “Cannot import …. Not all data was successfully written to the registry. Some keys are open by the system or other processes.” I still had regedit open so I closed and tried again – no joy; same message. I double checked I had no Snipping Tool dialogue box open and I could not locate any Snipping Tool process in Task Manager. Would love to know what the reg edit is supposed to fix and would also love to know why the hell Microsoft hasn’t fixed this. I’m on archaic Win Vista for Business. In windows 7 just go to “services” and find “Tablet PC Input Service.” Double click and make sure “startup type” is set to “Automatic”. That solved this problem for me. THANK YOU! This did it for me too. I have a desktop computer and was cleaning up the unneeded crap in my startup and was like “Why would I need Tablet PC services?” so I disabled it along with a bunch of other things. Quick and easy fix. After dealing with an Avast expert, his only answer was to restore and this would have cost me ten days of saved information. Your solution worked first time. Tusen takk as the Norwegians would say – thousand thanks as I would say. I have a similar problem in that I can use it to snip and copy but it won’t paste anywhere online. I’m trying everything to fix snipping tool. I read where I can delete it and then reactivate it, but I can even find it in task manager. It’s still on my tool bar as well.